National Elevator Industry, Inc., as a service to the elevator industry, publishes this standard. References to compliance with ASME A17.1, NFPA 70, ICC/ANSI A117.1, ADAAG, etc. are intended to be read in conjunction with the applicable referenced regulations. Local codes are not addressed. This information is presented without warranty, and neither National Elevator Industry, Inc. (hereafter NEII®) nor its officers, employees or members assume any liabilities or responsibilities for the accuracy of information, comments, opinions, representation or data contained herein. No liability is assumed by NEII for decisions or commitments made on the basis of the information provided. The Americans with Disabilities Act (ADA) provides for injunctive relief and, in some cases, monetary fines to be levied against a non-complying facility. A person held to have been discriminated against under the act may in some instances be entitled to monetary compensation from the entity in violation. Therefore, it is recommended that legal counsel be consulted before decisions are made concerning proposed actions to be taken in efforts to comply with ADA or the other regulations cited in this document. All illustrations, notes and specifications in this publication are based on what is believed to be accurate information compiled by research and advertising in trade journals and is effective at the time of publication approval. If any discrepancies are found to exist, notification of same would be appreciated, as this information will be considered for future revisions. THE INFORMATION CONTAINED ON THIS WEBSITE IS UPDATED FREQUENTLY. USERS ARE ENCOURAGED TO ACCESS THE SITE TO ENSURE THAT THEY ARE USING THE MOST RECENT INFORMATION. DO NOT DOWNLOAD FORMS OR OTHER INFORMATION FOR SUBSEQUENT USE. No part of this document may be reproduced in any form, in an electronic retrieval system or otherwise without the prior written permission of the publisher. 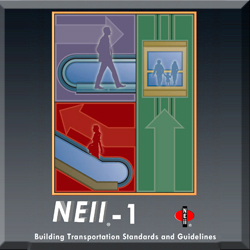 NEII hereby grants a license to any company engaged in business in the elevator or escalator industry to use any or all of the Specification and Drawing Checklists, Flood Requirement Data Form, Seismic Requirement Data Form, Power Confirmation Forms, Pre-Modernization Evaluation Form, Pre-Modernization Checklists and Maintenance Evaluation Forms contained in this publication in the ordinary course of business for such company, provided that such form(s) are reproduced in the precise format which is shown in this publication, including the notation that the form(s) is copyrighted by National Elevator Industry, Inc. and the form(s) is not altered or modified in any manner. The insertion of the information called for by the form(s) and the signing of the form(s) by the licensee and the person or firm with whom the licensee is doing business is expressly permitted by this license. The re-publication of these form(s) in any public or private newsletter, magazine, newspaper, trade periodical or any similar publication, or through any electronic means, including but not limited to an electronic bulletin board, is expressly prohibited without the prior written permission of NEII. NEII reserves the right to revoke the aforesaid license at any time and for any reason, but any such revocation shall not invalidate the use of any of the form(s) by any licensee prior to the date of such revocation. The licensee may contact NEII at any time to determine whether the license has been revoked. NEII does not make any warranty or representation as to the accuracy or completeness of the information provided. Neither NEII, nor its employees or agents, shall be liable to recipient, or its employees or agents, resulting from their receipt or use of the information. NEII disclaims all warranties implied or statutory including but not limited to any warranties of merchantability, fitness for a particular purpose, and non-infringement.